Only you can save one brave piglet from certain bacon...er, doom. When you really think about it, pigs probably have the rawest end of the farm animal deal. We don't milk them and they don't lay eggs. The only thing they produce (besides adorable movies where they herd sheep) is meat which, as you might expect, is not a pleasant experience. Inspired by the plight of pigs everywhere, Slaughterhouse Escape follows the quest of one brave piglet to escape from a slaughterhouse and avoid their doom. Recently featured as a free-to-play browser game on The Escapist Arcade, we're happy to announce that it has received the mobile treatment courtesy of The Escapist's sister site Addicting Games. 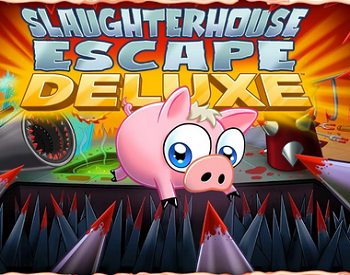 Now available as Slaughterhouse Escape Deluxe, the updated version will bring the same addictive arcade experience to iOS and Android platforms. Players will now have an endless parade of spikes, grinders, forks, saws and blood pools to survive and navigate, right in the palm of their hand. Run the game's procedurally generated gauntlet as you collect golden apples that can be used to unlock new pigs from a multitude of choices.. Getting bored with your standard piglet? Spend some apples and take the Pirate Pig for a spin. If that sounds at all fun to you, we'd definitely suggest you give the game a try at The Escapist Arcade or download it to your iOS or Android equipped mobile devices. It might not be as good as bacon but, then again, how many things really are?